Bristol-Myers Squibb Co. (BMY) had a wild year, up from the lows of $47.54 in mid October 2014 to reach a new 12 years high $69.20 in March, 20th 2015, getting a boost from the fastest FDA approval I ever seen. On Febreuary 27th 2015 the FDA granted Priority Review for Opdivo for Advance Squamous NSCLC with PDUFA goal date in June 22nd 2015, but a week later, March 04th the FDA granted approval for Opdivo, giving the fuel for a new upside to reach a new 12 years high. Lately the price started a technical correction along with Biotechnology Index, breaking down the weekly support line $64.75 to reach again the 50-Day moving average around $63, very close to the Fibonacci 61.8% retracement line, at the same area we have the mid term uptrend line that supposed to be used as a strong support line as well. Meanwhile the indicators getting a reset too where the Stochastics drop to the Over-Sold territory and the RSI is very close too. 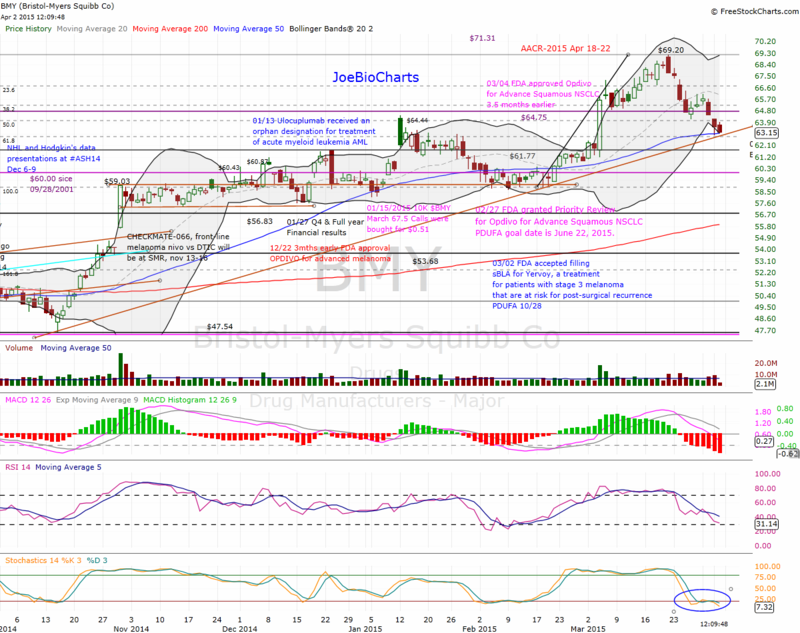 Despite the strong support area, we can’t predict a reversal pattern yet, as the IBB still unpredictable and under a lot of selling pressure lately, in case of breaking down the lower channel’s line again and the 50-Day moving average, we might get another leg down in the sector that can affect BMY as well. As posted today at the Chimera’s private feed, we can start building a position around the 50MA, with the intention of adding more June calls at any dip, or in case of getting a reversal pattern next week and starting a new uptrend. We are getting closer to the AACR-2015 that will start on April 18the to 22nd followed with ASCO-2015 from May 29th to June 02nd as well, both meetings brings a lot of attention and price action, it is a good time to start building a position.